Architect: The Jerde Partnership International, Inc. 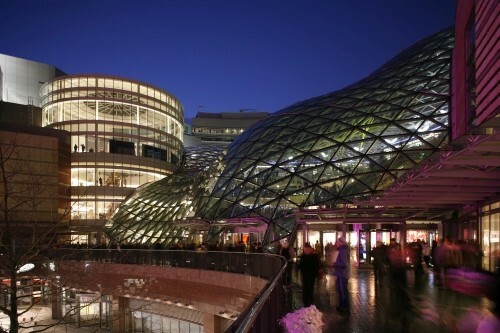 The project Zlote Tarasy is inimitable for Warsaw and Europe. It is located in the very heart of Warsaw adjacent to the central station and in the proximity of the palace of the culture and the science. Zlote Tarasy will play many functions, in addition to shops and restaurants, the complex will also include a cinema, offices and parking facilities. 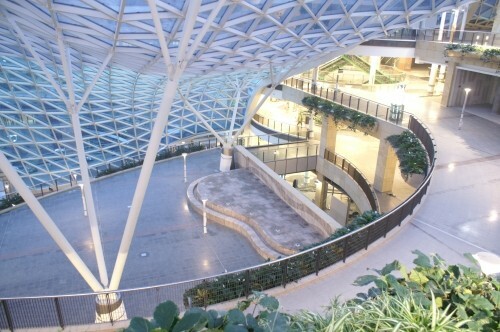 The shopping area in the centre of the complex is canopied by a 10.000 m² steel-glass-construction. The front side of the roof reaches the ground floor and presents the main entrance and the primary connection of the inner and outer public areas of the whole building. The roof consists of a wavelike extensive grid, formed by welded steel elements which carry the triangular glass panels. 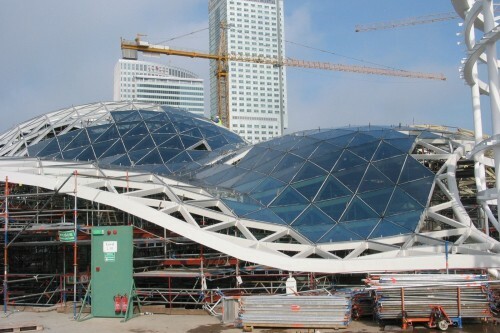 4800 different glass panels, 7200 different steel members and 2300 different nodes were used. The roof is supported on the adjacent buildings and additional by eleven tree columns. In the south of the atrium roof the Drum is located. This cylindrical element is designed with a total height of 30 m. Above level 03 the drum is designed as steel structure with a height of 13,5 m, the lower levels consist of concrete components. The diameter of the drum is 25 m. The walls as well as the roof are circumscribed by insulated glass panels. The roof construction consist of rectangular hollow sections, which form with a spacing of 30 degrees the roof cone. The “Trimming Tube”, which corresponds with the edge of the atrium roof, is designed as freeform and serves as stiffener for the drum.